When Enrique Tierno Galván died in 1986, his funeral brought out a million people to say goodbye. What made that man so loved? He became mayor in the first democratic elections under the post-Franco Constitution in 1979. A city that had grown grim during the dictatorship was transformed with new movement and freedom under his leadership. In addition to promoting culture both high and low, he initiated some much-needed improvements, such as sewage treatment that allowed ducks to return to the Manzanares River. 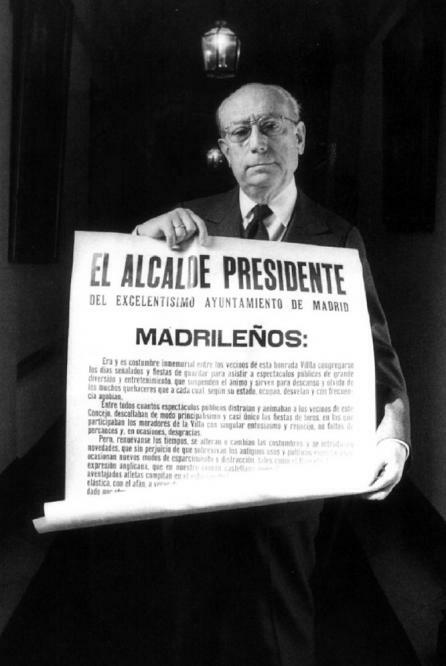 “The old Professor,” as he was called, taught at universities, was a political prisoner in 1957, and wrote the preamble to Spain’s new constitution, along with dozens of books. His celebrated mayoral edicts demonstrated his irony and erudition. The one he is shown presenting here addresses the upcoming 1982 FIFA World Cup games. Since time immemorial it has been and remains customary among the inhabitants of this honorable Town to observe and assemble on holidays and special occasions in order to attend public performances of great amusement and diversion that captivate the spirit and serve as rest and respite from the many tasks that keep them all, according to their position in life, busy, awake at night, and often enough overwhelmed. Among all the many public performances that have entertained and enlivened the residents of this Municipality, the primary and most uniquely foremost have been bullfights, in which those who dwell in this Town participate with singular enthusiasm and delight, notwithstanding mishaps and, on occasions, misfortunes. But, as times are renewed, customs alter or change, and novelties are introduced that, without detriment to the survival of older habits and public performances, give rise to new means of relaxation and amusement, such as so-called “football,” a British expression, which in our common Castilian is equivalent to having eleven skilled and outstanding athletes compete in the endeavor to propel with their feet and head a pliant ball pursuant to the desire, at times disproportionate, of entering it into a location solicitously protected by another squad of eleven athletes, and vice versa. So great is the enthusiasm this has awoken in all nations and with such notable passion throughout the entire world that the principal minds who direct and arrange the public presentations of the aforementioned entertainment have chosen our Royal Town and Court so that, in its fine stadiums and with the aim of celebrating the games’ grandeur and splendor, the best squads of each nation will compete in their final encounters, which will attract to this honorable city innumerable visitors from the many countries that populate the Earth. Although it is notorious and of common knowledge that the inhabitants of this Town tend to turn a doorpost-deaf ear to the warnings and admonitions of the Mayor, may I be permitted to recall that among the virtues which make a denizen faultless and consummate, very principal is courtesy, thanks to which we maintain old friendships, earn new ones, accept strangers, no few times turn hostile enemies into close and trustworthy friends, and in addition cause those who visit cities populated by courteous residents to sing their praises, amazed by the agreeableness of its dwellers. Given that this town, due to the grand and renowned games of “football” of which I have previously spoken, will be visited by innumerable curious and enthusiastic travelers, it is proper and very appropriate that we maximize the aforementioned virtue of courtesy, which commonly among ourselves is forgotten on occasions of worry, toil, or carelessness, or even annoyance and anger. Thus I beseech Madrid’s residents, as the leader of this Royal Town, to pay especially heedful attention to our visitors, leading the lost, orienting the perplexed, calming the anxious, helping those in need, and consoling those to whom the magnitude, complication, and immoderation of this great city may bring tribulation or disconcertion; indicating our intentions by means of gestures, tracing routes on maps, or accompanying them on their way, necessary actions to undertake when, as can occur with abundant frequency, we lack familiarity with their own native language or any other to which they might resort. This Presiding Mayor also advises its inhabitants with utmost severity but not without affection that they take pains to maintain the cleanliness of its streets, the tidiness of its buildings, and the impeccable parking of cars in their proper locations, to the awe of our visitors and to our own gratification and contentment. Among the copious wealth of reasons that urge us to remain vigilant to attend to and care for our visitors in their extreme numbers and very different idioms and homelands, principal is one that cannot help but be keenly discerned by the inhabitants of this Locale: to wit, that a multitude of men, women, and perhaps children, adroit in the art of seizing possessions from others, will come to this Town, taking advantage of the circumstances of such a favorable occasion as the above-mentioned world games, so that the common number of rogues, pickpockets, vagabonds, cut-purses, and many others of dubious condition who already exist in this Municipality will be joined by those incorporated from elsewhere, for which reason we must add to courtesy the most solicitous vigilance in order to avoid thefts, robberies, and illicit and covetous ruses which, were they to abound, would sully our good name and reputation. Finally, those who dwell in this Town should know that while the motives for virtue may be quite weighty and insistent, so are those for material advantage, which will grow in proportion to the greater diffusion of our honest behavior and merit. Thus I confidently advise the inhabitants to carry on with fortitude, heedful of the renown and prestige of this Royal Town. Here is a famous 5-second video of the Mayor introducing a rock concert during the Madrid Movida in which, using a play on words, he encourages the audience to either take their seats or get high. This is such a joy! "The exceptional happenstance also occurs in our city that a considerable proportion of its residents frequently throw papers and objects on the ground, and the Municipality pays other residents to pick them up. If this surprising conduct continues, it may come to be that half the residents throw papers and objects on the public way and the other half picks them up." This remark from 34 years ago is sometimes quoted to this day because the residents of Madrid still litter freely, and the city still hires people to clean up after them.